It can be an uphill battle to get personalized advice about your job performance and your career progress. Earlier this week a friend and I texted about the challenge of extracting good feedback from management in our modern litigation-averse corporate America. So the trick is to find those mentors. I appreciate constructive criticism from anybody willing to lob it my way, but I especially appreciate getting it from successful entrepreneurial types (S.E.T.) who are living their dream. increase my employer’s profits by the boatload (not all ideas are big wins, but all big wins come from ideas). Unfortunately, such jobs are few and far between. While there are some great aspects of my current job (it’s challenging, fast-paced, exposing me to new-to-me parts of the business, and immersing me in new technologies), I’m not in a role in which I am expected to—or in which I or my peers have largely been able to—have a broad degree of product, business, and technical influence. So I asked my S.E.T. friend: How do I sell myself and my capability, to advance into more senior roles—what do I need to convey about myself, and to whom? The answer was to talk with a career coach. Do I need more experience in startups to do another startup? He suggests not. If I have an idea and can grab people and start pursuing it, the sink-or-swim-myself model is apparently just as good as watching someone else sink or swim. He was definitely big on the idea of me going to startup(s) though. He noted that if I feel that my career has stalled that’s because it has stalled, and at mid-sized companies filled with relatively young people there just aren’t going to be opportunities that open up for me for vertical movement. He was also very cautionary to do my due diligence before going to a startup. Know the founders, know whether they’re in good shape technically—are they hiring me to grow or to survive? How do I market myself to land the opportunities I crave? Change my resume from a laundry list of things I’ve done to an expression of who I want to be. De-technicalize it, replacing the jargon with evidence of leadership—in general, present myself in my capacity to lead. Clarify through the top-of-page-1 material that I’m looking to be considered for executive leadership, and that (separately) I have the credentials of coming from a solid technical background. As an example, if I’m being evaluated for a CTO role then a CEO is going to look at whether I led a team through something instead of just the individual things I’ve done. Don’t make the reader search for it, put it clearly and up front. If you want to be an executive you need to tell the reader that you’re an executive. Simultaneously update LinkedIn profile to be a resume supplement, focusing on brief powerful statements in the “summary” section at the top as an attention-grabber. Also create an AngelList profile. If I want to inject speed into an executive career path—moving through a career at a faster pace than I could expect by simply working through promotions—business school can provide that. But don’t look at school as all you need or as the last piece of the puzzle; you’re being taught in the classroom a lot of what you’ll have learned in the workplace. There are too many B-school graduates already and they’re mostly in their mid-20s. It’s less of a unique credential/ticket than it used to be. He espouses a go-big-or-go-home philosophy: If you’re gonna go to business school, and if you can afford it, go full time so that you get an intense, immersive, fast-paced experience. Make an effort to land that next job that gets you on the right track to find the position you want. Look for director or VP roles. Don’t move horizontally. Always be job hunting; never settle down. Submit your resume early and often. Write your CV and cover letter in such a way that you can recycle them in 5 minutes for any new opportunity you see. (When asked about whether I should try to find a longer-term coach to work with.) Don’t worry about finding a regular coach for now. He doesn’t know anyone who does coaching on the side (except coaching for C-level executives) but in any event he feels that being in the game (circulating, getting interviews under my belt) would be more useful for me than being on the sideline (talking to a coach). Overall a great conversation. The main takeaway matches something I’ve heard before (though it’s hard to do): Market yourself by presenting your past in the context of the job you want, not necessarily by conveying the minutiae of the job you had. Describe your previous work by highlighting the things you did that you did well, that you got something out of, that you enjoyed, and that are most relevant to the position you seek. 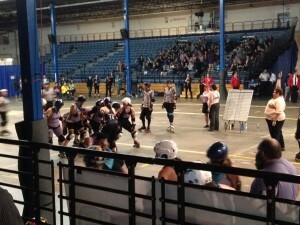 I wasn’t really clear on the concepts and principles behind flat track roller derby until I watched a game last night. I’d been wanting to attend a Boston Derby Dames match for the past two years, ever since I heard that Boston had an active roller derby team. And last night I did! It was a doubleheader, featuring a B-league matchup (Boston B-Party vs. Charm City Female Trouble) and the main event (Boston Massacre vs. Charm City All-Stars). The skater names these athletes choose for themselves are hilarious. A few that I texted to Evelyn: “Boston Creamer”, “M.C. Slammer”, “Allie B. Back”, “I. M. Pain”. Even the officials were in on the fun: “Buxom Melons”, “TestosteRon Jeremy”. A 60-minute game is made up of a series of 2-minute “jams”. A jam is 5-on-5 skating in a counterclockwise direction. In a jam, each team fields one “jammer” (similar to a football quarterback) and four blockers. Jammers score points by lapping members of the other team. Blockers try to (a) stop the other jammer from lapping them, and (b) disrupt the other blockers so that their jammer can make progress. Skaters are not allowed to grasp with their hands, so hip checks are common. It’s not (much) violence! 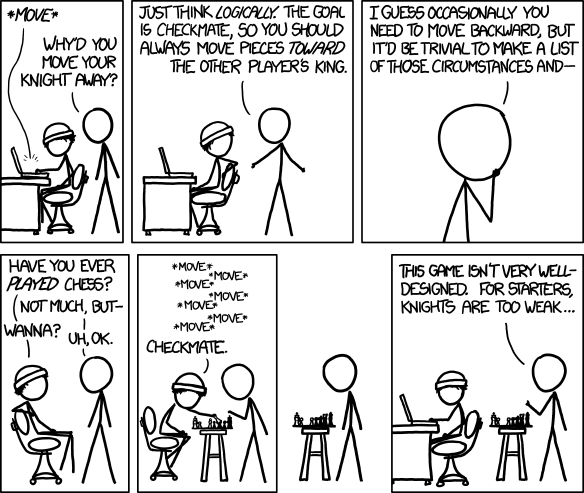 Rather, strategy and agility are important. Brute force only gets you so far. That last bullet was my favorite part of watching the games: As the game wore on, and the blockers became more familiar with the jammers’ jukes, and the skaters collectively grew more tired, and more skaters got sent to the penalty box (yielding 5-on-4 or 5-on-3 skating), it was very interesting to watch the teams shift their strategies—switching up personnel to get more favorable matchups; lining up differently at the start of a jam; inducing the pack of blockers to move more quickly or more slowly around the rink; trapping a skater on one side of the track and forcing her out of bounds; making use of a quirky rule to switch which skater is declared the jammer in the middle of a jam. Protip: In order to notice these things it was very helpful to be sitting next to Jodie and Brittany; I highly recommend that anyone new to roller derby make it a point to sit next to people who look like former or current skaters. An interesting aspect of the roller derby leagues [according to my guides] is that it takes up about 20 hours a week for each of the team members (on top of their full time jobs needed to pay for skating equipment)—not just practice time, but also business activities such as reserving venues or merchandising or soliciting sponsors. As an away game, the teams from Baltimore likely drove themselves up I-95 and stayed at skaters’ houses to save money. Somehow knowing that each skater had an integral role in the functioning of the team and the league (instead of, say, a small powerful board taking care of such details) made the skating more fun to watch. I had a good time, though I doubt I’d go back to see another game. There are two perplexing rules whose enforcement took away a big part of my enjoyment of the games. One rule imposes a grossly unfair penalty for infractions by a certain class of skater (a violation of the Equal Protection Clause). The other rule flushes down the toilet almost about 75% of the opportunities for skaters to demonstrate strategy and agility (“my favorite part of watching the games”, as described above). These two rules vexed me so much that they inspired me to write this blog post to suggest that the rules be changed. Eliminate penalties that send jammers to the penalty box (6.1.1). Each time you send off a jammer it’s a blank check for the other team to score 15 to 20 unanswered points. Baltimore lost by 14 points last night, in a game where three seemingly bogus penalties on Baltimore jammers netted about 45 total points for Boston. Under current rules, the defense is penalized more than the offense for the same foul. Let’s make defensive and offensive holding equivalent. 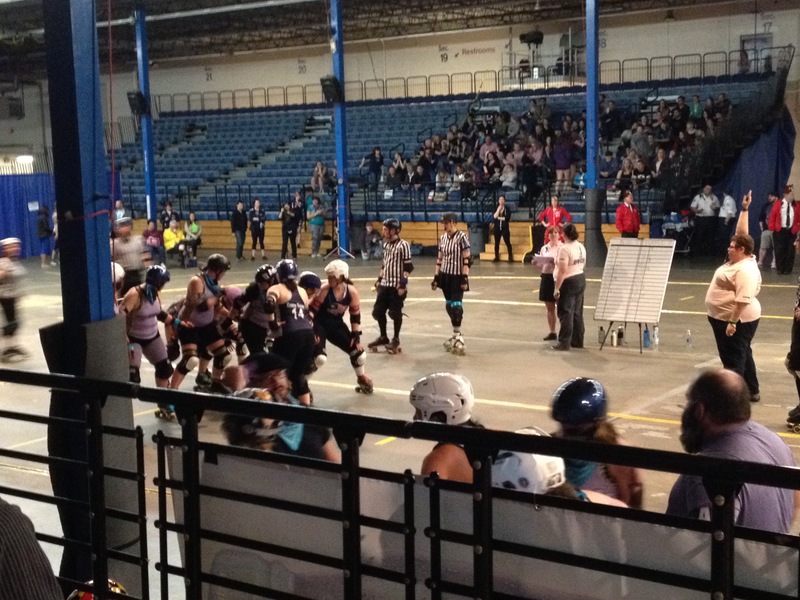 But back to roller derby, the rule to send off jammers for penalties is one of the worst rules I’ve ever seen in sports. Limit (or eliminate) the concept of Lead Jammer calling off the jam (2.4.7). It is truly dull from an audience perspective to watch the jammer make one loop of the track, pass the blockers, and immediately call off the jam for a ho-hum 4-0 score. You’re wasting 90 seconds of potentially audience-stimulating action! Teams could be limited in the number of times per half that a jammer could call off the jam, making it a strategic (instead of tactical) decision for when to call off the jam. The Lead Jammer (or perhaps just the jammer currently in the lead) could receive a bonus point every time she laps the pack, or bonus points just for being the Lead Jammer (cf. NASCAR points for leading the most laps in a race). The Lead Jammer could accumulate more than 1.0 point for each blocker passed, or could receive another scoring modifier. Jammers could only be eligible to call off the jam if in the lead under certain conditions (for example in every other jam [cf. vulnerability in Bridge], or only when trailing in score, or only in the first half of the period). I felt this rule was just plain dumb. For the first 20 minutes of action I couldn’t figure out why the jams were ending with time still left on the jam clock. Once it was explained to me, I couldn’t fathom why the rules authority would go out of its way to make the game boring to its audience. Eliminate some of the 30-second delays between jams (1.5.3). Instead of having a new set of personnel out to line up start ever discrete jam, consider having a continuous “extended jam” concept where winded skaters are allowed to be replaced with fresh skaters while the action continues around them (as in relay speed skating, or hockey, or tag-team wrestling). The personnel changes could happen continuously (for example by a skater tagging out with another skater in the clearance area outside the track); or they could happen on a referee’s whistle at 2-minute intervals. Scoring could continue with whichever skater is currently wearing the star helmet. Perhaps the last 10 minutes of each period could be skated under the “extended jam” concept? Anyone from the WFTDA Rules Committee is welcome to contact me (see instructions on this page); I would be happy to elaborate on any of the above three points. Imagine, if you will, a much younger John. Ten years ago, almost exactly to this day, I stood on the rain-slick precipice of darkness, scrying into the future to decide what’s next? for my life. I had spent the past six years as a student in the best storage systems research laboratory in the world, itself part of the #1-ranked computer engineering program in the world. I’d learned how to think in graduate school—how to explore the question why?—how to look at trees and see the forest. I’d gained confidence: confidence to formulate and pursue a technical hypothesis, confidence to take the risk that a line of investigation might be wrong, confidence to lead and advise others in the pursuit of their personal goals. I had spent most of those six years assuming that I would follow in the footsteps of my thesis advisor—become a tenure-track faculty member, set a visionary research agenda and rally a large team to sponsor and drive the work, change the world through my research results, and nurture my own set of wide-eyed/wet-behind-the-ears students into the change-the-world visionaries of the future. I had a wonderful girlfriend ready to help me succeed in my career, supportive colleagues and contacts in academia and industry, a solid record of publication and public speaking, a reasonably compelling vision for my future research agenda, and an eagerness to move somewhere new and experience/travel/enjoy being there. I had my choice of off-the-hook amazing job offers in amazing places. In academia, both the University of Edinburgh (Scotland) and the University of Waterloo (Canada) offered me the academic positions I’d dreamed about. I’d also interviewed at world-class industrial and business firms—including Google, Hitachi, Intel, McKinsey & Co., and Microsoft Research—and had received offers to work directly with two of the most impressive people I’d ever met (John Colgrove at Veritas Software near San Francisco, or Dr. Leendert van Doorn at IBM Research near New York City). I was the king of the world! But then I asked my advisor a question he couldn’t answer. I asked for my advisor’s advice on how to choose which job to take—what to consider in terms of internal and external impact, work-life balance, and personal satisfaction; what I could expect over the first few years of my career; what were my personal strengths and weaknesses that would be unique (or be problematic) in each position; how each choice would tie in with my long-term career and life plans. He answered that he couldn’t advise me. He couldn’t because he had only ever worked in academia; he didn’t have the experience to help me understand what I could expect; to suggest which choices would open or close which doors; to guide me toward the right decision for me. That answer stunned me. It opened my eyes that I would have the same limitation if I went straight into an academic position. It was the mentorship aspect of a job in academia—the “confidence to lead and advise others in the pursuit of their personal goals” and the “nurture my own set of wide-eyed/wet-behind-the-ears students into the change-the-world visionaries of the future”—that was the key draw to my pursuing such a position. From this conversation with my advisor I realized that I needed more personal work experience in order to pay forward the gifts of encouragement, nurturing, guidance, and freedom that I’d received from my teachers and mentors over the years. Moreover, if I was going to change the world I realized that I needed a better understanding how the real world works. At Carnegie Mellon I saw firsthand how many successful faculty members pursued technology transition: Some, like my advisor, built relationships with key technology companies in his field and freely shared results (and freely shared graduate students for internships) to ensure a steady flow of ideas and technology both into and out of his group. Some, like Dr. Phil Koopman, applied his years of industry experience toward choosing projects that were both academically rigorous and immediately practical for solving the complex problems that had vexed him but that industry couldn’t (or wouldn’t) solve for itself. And some, like Dr. Garth Gibson, took the flat-out entrepreneurial approach and founded a company to productize the game-changing technology concept he’d conceived, defined, explored, and proselytized over the past decade. So I decided not to pursue a professorship, at least not for a while, while I instead went out to discover how the real world works. I accepted the position at IBM, and the next decade turned out to be far more interesting (and far more interestingly chaotic) than I imagined they would be. Last year I became interested in working with M2M (machine to machine) systems. M2M is the simple idea of two computers communicating directly with each other without a human in the loop. The system [an Italian smart meter deployment] provides a wide range of advanced features, including the ability to remotely turn power on or off to a customer, read usage information from a meter, detect a service outage, change the maximum amount of electricity that a customer may demand at any time, detect unauthorized use of electricity and remotely shut it off, and remotely change the meter’s billing plan from credit to prepay, as well as from flat-rate to multi-tariff. Of course, with great power comes great opportunities for circumventing the security measures engineered into M2M components. In an environment where devices are deployed for years, where device firmware can be difficult to update, and where devices are often unattended and not physically well secured—meaning potential attackers may have complete physical access to your hardware—it can be very challenging to implement low-impact, cost-effective protections. Responding to this challenge, several researchers have given presentations or released papers that describe fascinating attacks against the security components of M2M systems. In one well-known example, Barnaby Jack explained the technical details behind several attacks he created that reprogram Automated Teller Machines (and demonstrated live attacks against two real ATMs on stage) in a presentation at the Black Hat USA 2010 security conference. In another, Jerome Radcliffe described at Black Hat USA 2011 how he reverse engineered the communication protocols that are used to configure an insulin pump and to report glucose measurements to the pump. A. Use a programming or debugging interface to read or reprogram a device. B. Extract information from the device by examining buses or individual components. C. Replace or bypass hardware or software pieces on the device in order to circumvent policy. A. Inject false traffic into the M2M network in order to induce a desired action. B. Analyze traffic from the M2M network to violate confidentiality or user protection. C. Modify component operation to fraudulently receive legitimate M2M services. A. Extract subscriber information from M2M infrastructure control systems. B. Identify and map M2M network components and services. C. Execute denial-of-service (DoS) attacks against infrastructure or routing components. The key takeaway is to think like an attacker! by preparing in advance for when and how security systems fail. A Maginot Line strategy for M2M may not be effective in the long term. I often recommend such planning to include (a) a good security posture before you’re attacked, (b) good logging, auditing, and detection for when you’re attacked, and (c) a good forensics and remediation capability for after you’re attacked.